It's just after midnight on Norfolk Island. Merry Equinox!! begins at 4:09 pm today! I thought it was at 2:02 ET. my daily astronomer guy says 4 this afternoon, EDT. i'll have to re-read it..
none aus!! i'll check my news... saturday or sunday? There are elections in the southern hemisphere? A country capable of giving the world Rolf Harris can do anything. i would love to find the whole broadcast series of Mary Backstage, Noble Wife. There's a lot of Bob & Ray on archive.org. i've used that, yes.. i imagine it's difficult to find the full series without buying it... YT doesn't really help to collate them. Hmm...if January 4 is a Wednesday, then this couldn't have been broadcast on the 31st. what a treat UM, this is wonderful! they crack me up... a genuine live comedian as a prize!! you started at 8 today? YAS I finally caught on to the time change! Dave scared me. I thought I started an hour early. Now annie...it's only 20 minutes. actually, i'm pretty happy with almost anything,, within reason.. I'm back, UM, had a great time (but I've had enough tapas to last me for the rest of my life!). (I liked the Morgan doc, though, as I think Doug said, didn't have enough of his music). Wen I was in Spain I think I held the tapas don to two or three occurrences. I'm glad you enjoyed your trip. what is this - some kind of FREAK-OUT?!? Someone pick a topic. I have time to chat. Yes Dave. The good kind. How's it in the Southland, Joe? I'm visiting the Outer Banks in two weeks. just discovered "Schnitzelbeat - Raw Teenage Beat & Garage Rock Anthems From Austria 1964-1970". not really a country one associates with craziness. what does one associate Austria with? I'll be moving back to noon in about 10 weeks. hey UM, you driving east? maybe stop and see us in asheville? my computer's starting to smoke! I thought I'd have my Friday Drummer shows to enjoy today, but noooooo, I have to get out to take an opportunity for a few more work hours. Because I have to swat at the dollars like a cat swatting at Forrmula One race cars. I was actually hoping I wouldn't get the call, like a kid hoping for no school. Annie, we're flying to VA and driving south. It's too early for me to start to smoke...but not for Dave' computer. ....these schedule changes... achh! whenever you DO happen to pass through UM, i owe you a good lunch. I endorse the pace of this particular show. Thank you, Annie. I'll keep that in mind! Interesting. I really haven't looked for that. Do you mean video footage in particular, @ausmanx? yep, video. i found a set from a US festival in 1980, and a set from poland, but there's a dearth of it... esp since it's pretty spectacular to watch as well as listen to! 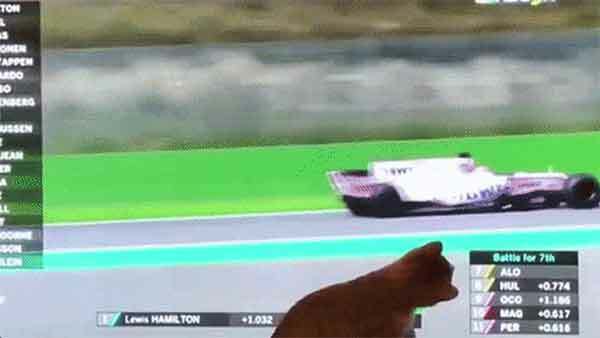 The cat in the gif seems not to care much for Sergio Perez. Ra makes a brief appearance in the '59 film The Cry of Jazz, but you seem to have hit on a real gap in the chronicle, @ausmanx. Cry of Jazz is a weird one. But worth viewing. It's on ubuweb. all day discussions with the russians? Surely I'm not the only person dancing to this Mueran Humanos track. Neat. I have a large, old (you should see some of the country names) world map on the wall here, and I just found Norfolk Island on it. With Uncle Michael, you get rockin' sounds *and* a geography lesson! @UM- Thanks for being here! Hello Uncle. Looks like election weekend around the globe. Just fell in, it looks like UM is taking the Bryce route, although there is three more songs then he would have on his normal playlists. Diggity-do! I love this track and I'm going to hope you do too and it's not just that you ate some bad fish or something. I love this track and album. this is a wild show! The Complete On The Corner Sessions is a mindfuck of amazing fun! Hey there! Listening to the drummer steam more nowadays. Danny, this is something that if I ever do similar again...it will be another 4+ years coming. yeah, that was great, LD! Did you know His Name is Alive did an album of Marion Brown covers? thanks NGH - did NOT know that! Worth checking out? I've heard Warn Defever do more free jazz/noise stuff before, but it's more of a post-rock/dream-pop take on Marion Brown. I like it, but I seem to like everything His Name is Alive does. I love Jenny Odioline, LD! Does Jenny Odioline play an ondoline? the coffee at work legitimately tastes like mud.. is this legal? Thanks, Danny. I can put you onto my mic processor if you want similar, stupid audio tricks! I know Stereolab has used an ondioline, but I'm pretty sure they used only moogs and farfisas for that song, oddly enough (I could be wrong). I promise everyone a soft landing in the final set. If you'll pardon the self-plug, for those who dig on long songs, D:O Radio has done several such shows, typically three or four tunes per three-hour show. This program really makes me feel I be long. Maybe now I don't have to. Doug, mind if I go a little long? For real. ok, 104 minutes it is! hot damn, how long is this?! not complaining, just curious. Thanks for letting me do my thing...in front of everyone. That's a pretty smooth thing. Stick around for Doug and Give the Drummer Some, NEXT! Is this Bar-Kays guitarist Marcus Price? oh damn, a 33 minute version! Rich, I think it's Charles Pitts. What Jeff G said. Epic epic-ry UM! dang, what a track. Thanks Uncle Michael! till next time! Longing for more radio? Stick with the Drummer Stream, kids. Give the Drummer Some is next. Uncle Michael did his thing. Thanks for the thing that you did. Groovin' on the the Jimmy Smith, Archively on Friday night. Way Cool!